Originally published under the title, "A major victory – but hard to replicate." A Syrian Kurd flashes the V for victory sign during a celebration rally on January 27. The near-complete liberation of the Syrian Kurdish town of Kobani this week from Islamic State (IS) forces is a remarkable testimony to the tenacity and courage of the Kurdish resistance on the ground. It also showcases the awesome efficacy of US air power, when given a clear mission and properly directed. It is nevertheless necessary to qualify some of the more hyperbolic reactions to the announcement of the IS retreat. The relief of Kobani in no way constitutes a general rout for the IS forces; neither does it signal a "beginning of the end" for the movement and its quasi-sovereign entity. Indeed, the expulsion of the jihadists from the town does not even conclude the task facing the Kurdish fighters in the immediate vicinity of Kobani, nor does it offer any general lessons regarding the possible efficacy of Western support for armed groups in Syria or Iraq. The relief of Kobani in no way constitutes a general rout for IS, nor does it signal a 'beginning of the end' for the movement. The defeat does constitute one of a series of significant setbacks that IS has suffered in recent days. All of these were at the outer reaches of its advance: Iraqi government forces and Shi'ite militias, for example, took Diyala province; the Kurdish Peshmerga is conquering ground outside Mosul. Still, the "heartland" of the jihadi entity in Syria's Raqqa province, and the greater part of its conquests in Iraq of last June are not yet under threat. Regarding the specific issue of Kobani, the town came close to falling in early October of last year; the fighters of the YPG (People's Protection Units) appeared to be preparing for a last stand. Civilians were long gone from Kobani, but the YPG also sent out all personnel not essential for the fighting, and all journalists. The assumption was that IS would surround the town from the north, and the Kurds would then fight to the death – street by street – until the inevitable conclusion. That this did not happen is attributable, in the first instance, to the commencement of US and allied air attacks on IS forces massing around Kobani. These began in mid-October and have formed by far the most intense aspect of the Western air campaign against the terror movement to date. Gen. John Allen, the retired US officer responsible for coordinating the campaign, was initially circumspect about the goal of the air strikes, describing them as a "humanitarian" effort intended to buy time for the defenders to reorganize on the ground. The reinforcement of lightly armed YPG fighters with the artillery and mortar capability of Iraqi Kurdish fighters in late October helped stiffen the resistance to IS forces. As the weeks passed, however, it became clear that a strategic decision that Kobani should not fall had been taken. Evidently, the intention was to crush IS gunmen between the hammer of US air power and the anvil of ongoing stubborn Kurdish resistance; in so doing, a symbol of resistance would be created. This appears to have paid off. The reinforcement of the very determined but lightly armed YPG fighters with the artillery and mortar capability of the Iraqi Kurdish Peshmerga fighters who entered Kobani in late October certainly played a role in stiffening the resistance on the ground. Yet the raw courage of the YPG deserves top billing in this regard. As a result of the Kurdish stand on the ground, the US was able to take a great cull of IS fighters. The jihadists' assault tactics are simple (though often effective), and involve human wave attacks. The US was able to observe the jihadists massing for such attacks on Kobani, and to target them from the air; IS found no effective response to this. With regard to the movement's armored capacity, the situation was the same; the tanks were visible from the air and IS continues to have no effective defense for them. Hence, the very heavy losses suffered by the jihadists in trying to take Kobani. Yet the victory is only partial. It is important to remember that Kurdish-controlled Kobani, prior to the IS assault in September, did not consist of Kobani city alone. Rather, "Kobani" constituted an area stretching from Kobani city to Tel Abyad in the east and Jarabulus in the west, plus several tens of kilometers in a southern direction toward the Euphrates. It was this enclave which IS sought to destroy last autumn, because the enclave jutted into northern Syria and prevented the Islamists from rapidly moving forces from east to west. It stood in the way of any future ambition to expand IS territory westward into Aleppo and Idlib provinces – so Kobani had to be destroyed. The larger task of reconquering the 300 villages and the ground that once was a part of the Kobani enclave remains before the Kurds. As of now, the Kurds and their allies have succeeded in saving the city of Kobani, very close to the border with Turkey. This area became a symbol, and IS wasted over 1,000 of its fighters trying unsuccessfully to capture it. But the larger task of reconquering the 300 villages and the ground that once was a part of the Kobani enclave remains before the Kurds. One may assume that this effort will be under way in the weeks ahead. Regarding the larger lessons of the Kobani victory, it would be mistaken to jump to the conclusion that it illustrates that in providing support to anti-IS forces on the ground, the West has discovered a winning formula which can now be replicated elsewhere. This would be a rash deduction because of the specific nature of the Kurdish fighting organizations – YPG and Peshmerga. In Syria, as in Iraq, the Kurds have developed organizations which are pro-Western in orientation, committed to the mission and efficient. The problem with the Syrian rebels, as with the Iraqi militias and forces, is that they cannot manage all three of these. If they are committed and effective fighters (like Jabhat al-Nusra in Syria or the Shi'ite militias in Iraq), they will be anti-Western. If they are pro-Western, at least nominally – like the Iraqi-armed forces or the Syrian Revolutionaries Front in northern Syria – they will tend to be corrupt or ineffective. The reasons for this are manifold and open to debate, but it is a clearly observably empirical reality. 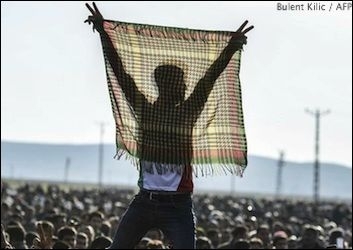 This means that while the West should double down on its support for the reliable, secular and anti-Islamist Kurdish forces, now controlling a long belt of territory stretching from the Iraq-Iran border to deep into Syria, Western policy-makers should be wary indeed of applying any general conclusions from the achievement in Kobani to forces other than the Kurds themselves.